Look- a sneak peak of the cards for this week. If you haven’t booked in yet for either the 10am or 7.30pm class, please book ASAP. Posted in Cards, Classes, Fathers Day, Masculine cards. Bookmark the permalink. Well, I must apologise for my lack of blogging over that last while but myself, Chris and the boys have been super dooper sick with the flu. But finally we’re all well and I’ve in the last few days gotten my stamping ‘mojo’ back! So look out for some more blogging coming your way real soon. 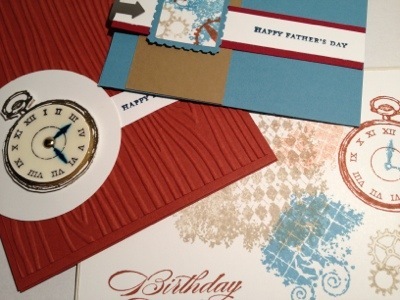 Fathers day is only just over a week away and here are a few ideas to get your creative juices going on your Fathers day cards. Or maybe you just find it hard to think of ideas for masculine cards? The basic rules are this: NO BOWS!! Lots of paper ripping, lots of metal and twine. Keep the colours muted and simple… browns, blues, greys etc. We made a few of these cards at our monthly class this week. The ladies flew through them and all seemed very proud of their results. Keep a look out for my next blog on my big 6 year olds party invites, birthday card and the all important birthday cake!! Posted in Cards, Fathers Day, Masculine cards. Bookmark the permalink. My class this month will offer you three different card ideas for the men in your lives. Do you struggle with male cards? I must admit I normally lean towards the female cards with all of the flowers and ribbons… but I’m really enjoying having a creative focus on boy stuff while preparing for hte class… metal, browns/blues etc etc…. and also challenging myself to use stamp sets I already have to get the maximum use out of them (that’s the true sign of a good stamp set… being able to use it for as many different people and events as possible).